Eraser: Jonah is more than a whale. My sermon from the 16th Sunday after Pentecost (September 24, 2017) on Jonah 3:10-4:11. Listen to the recording at the bottom of the page or read my manuscript below. A couple of miles up the road from here, in Park Ridge, is a big cemetery on the right hand side of the road. Opposite the cemetery is Our Lady of Mercy Catholic Church so everyone thinks the graveyard belongs to them, but it doesn’t. 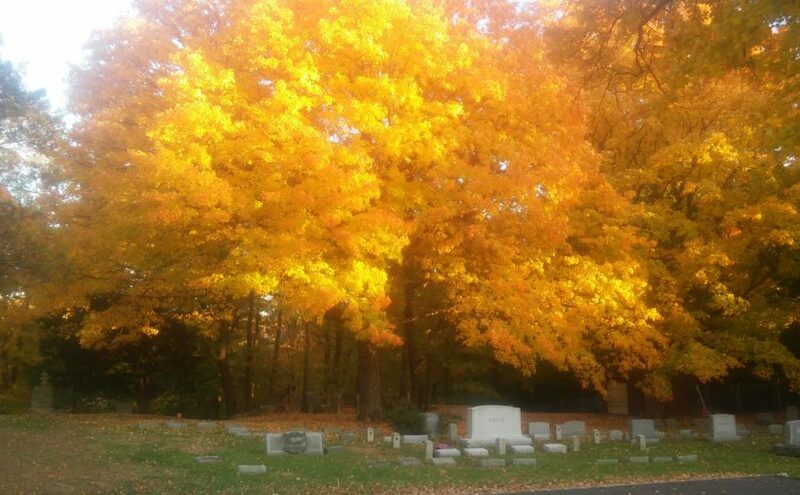 Instead, the cemetery belongs to Pascack Reformed Church which has been in the area for a long long time. This graveyard, like all active graveyards, is both new and old. Located inside its property lines are the remains of people who were buried this year and also those from the earliest farm families who first colonized the area. In the 1830s, free blacks started to be entombed there and they were followed years later by African-American veterans of the Civil War. Since the cemetery is old, some of the grave markers have toppled over, been buried, or had their markings rubbed away. But, overall, we know most of the people who were buried there. Yet there’s one section in that cemetery that’s a little mysterious. Behind the parsonage is a hollow in the trees that extends down the hill and to the creek below. There are no grave markers there. Only bushes, grass, and leaves. It looks almost empty…except it’s not. Instead, it’s an old section of the graveyard that might even pre-date the graves we know about from the 1740s. According to word of mouth, that hollow is where Native Americans were buried. Now there’s a debate among local historical societies about who is really there. The hollow has never been scientifically studied and there are no gravestones, of any kind, marking where a body might be. But the words of this graveyard’s existence are still in the air. And the tribes and people that buried their dead there – are, at this point, merely whispers…their names and identities lost to history. In a sense, these Native Americans are still around. We name our roads, towns, and high school mascots after them. But that’s about it. The families that might have remembered the names of those buried in that hollow were replaced by Dutch and Brits, Swedes and Germans, people who took over the land and passed it down to us. The native people who used to call this area home have been forgotten and it’s almost like they never existed. The hollow in that graveyard is the final resting place for a culture, a tribe, and a people that is no more. And that feeling, that reality of a people lost to history, is why Jonah, in our first reading today, is…so upset. As we see in these last verses from his story, Jonah watched as God did a completely ridiculous and unfair thing. God saved the people of Nineveh from destruction even though Nineveh had wiped ten tribes of Israel off the face of the earth. Nineveh is the capital of the Assyrians, the center of an empire that, in 722 BCE, destroyed the Northern Kingdom of Israel. Its capital city, Samaria, was burned. It’s population, ten of the twelve tribes that made up the Israelite people, were deported from their homes. They were forced at spear point to move to cities and villages on the other side of the Assyrian empire. Over time, they lost their traditions. They lost their identity. In short, those ten tribes were lost to history and almost forgotten. Only Jonah, and the remaining Jews around Jerusalem, remembered who they were. Now, when we remember the story of Jonah, we usually remember the whale. We remember Jonah running away from God’s call. But we usually forget why Jonah refused to go. He didn’t want to bring God’s word to the people who tried to wipe his people off the face the earth. He didn’t want to share God to those he didn’t think were redeemable. Jonah didn’t want the people of Nineveh to hear from God because if God actually spoke to them, then Jonah’s feelings of anger might be undone. Jonah had every right to be angry. And in the system of justice that make sense to us, where retribution is central and people are punished in response to the harm they caused, Nineveh should be destroyed. Jonah should not have to go there. But Jonah, in the end, cannot outrun God. He goes to Nineveh. He spends day and night preaching the same one sentence sermon, telling them to repent. And then….they do. They actually listen. They shouldn’t but they do which makes me think that the Holy Spirit gave them the ears to hear what this prophet from a people they tried to destroy, had to say. And Jonah can’t stand it. Nineveh isn’t supposed to be saved. But God, in the end, is bigger than Jonah. God’s grace and mercy and love are greater than the feelings of hatred and exclusion and violence that cause us to think we can decide who God cares about and who God doesn’t. We want to make our love the limit to God’s love. We want to make the grace we give be the limit to what God can do. We want to decide who gets to exist, who gets to be remembered, and who is finally lost to history. Jonah wanted nothing to do with God’s love. He wanted to erase Nineveh from the world. But the grace of God wanted to do something more. It…loved. God loved the enemy. God loved the ones Jonah thought didn’t deserve mercy, but God gave them mercy anyways. In the end, God loved because Jonah could not. And God showed him and all of us, the only kind of love that can truly change the world.